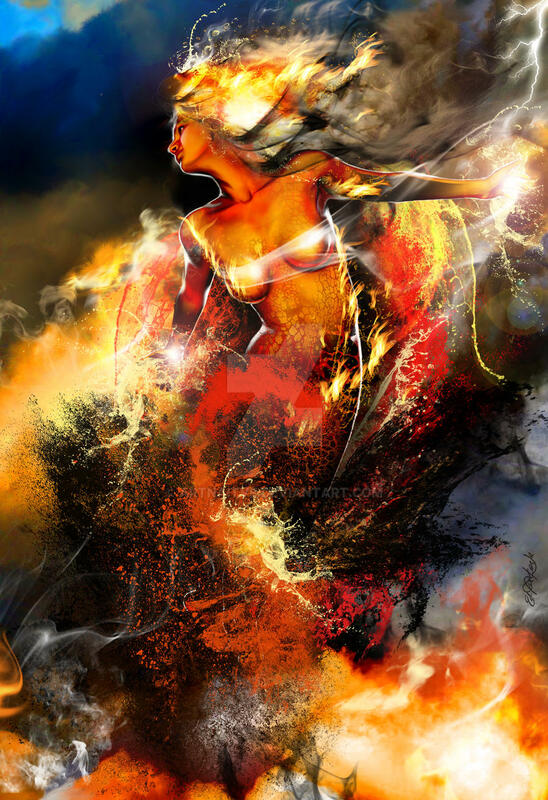 Pele - Goddess of Fire - Described as "She-Who-Shapes-The-Sacred-Land" in ancient Hawaiian chants, the volcano goddess, Pele, was passionate, volatile, and capricious. I wanted to express a beauty that I find in natures power and blend that with a confidant sensual female character. Because my most dominant heritage is Hawaiian I felt like trying to capture what I saw in my head from the stories I heard of Pele the Hawaiian Fire Goddess. I love to create using extremes. To reflect an intense contrast with colors, emotions and imagery. This is marvelous; one of the best depictions of Pele I've yet seen, I think. Those colors are incredible! I really admire the level of passion coming from this image of the beautiful Hawaiian goddess. Thank you for taking the time to stop and compliment my work. It is appreciated. Thank you for taking the time to compliment my artwork. Interesting ! She seems to be emerging from the elements. 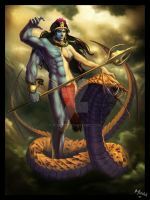 Passionate, volatile and capricious - Most of humanity's mythological gods & goddesses are just like their worshippers / devotees, no matter what culture they come from. Favorite part of this whole image: the hair. Wow! I love the shadow you have on the misty part of his hair. Just amazing! Having never been to Hawaii I gotta say this make me feel like I've been there. Just... wow! This picture is beautiful! Great job! Thank you for taking the time to compliment my work. No problem. Anything as good as this deserves a nice compliment. Uncle, this piece inspires me every time I look at it. I hope you get some time soon to keep doing pieces of Hawaiian gods. Thanks Crichton for the compliments nephew. I do hope that you are continuing your art. This planet does not have enough creative people creating, way too many people just destroy. Thank you for taking the time to compliment my artwork. Well there is much to the legend of Pele but I decided to ad my own personal interpretation. I did not want to make her angry, I wanted her to be comfortable in her element and to give the impression that she has a responsibility to do like all Goddesses. I feel that her reaction to another fire yielder would be one of mutual respect, but I am sure there would be a factor of ego involved with the position of power. Pele actually had a jealous issue with her sister (the Goddess of Water) who stole or seduced her husband in Hawaiian folklore. I appreciate the suggestion. I was working with that idea, from what I've been hearing from an aquaintance of mine who lucky for me is native to Hawaii, Pele had a bit of a temper and one website even described her as a goddess of violence in addition to her other duties. My only trouble is figuring how to get my character and Pele to meet. All I can think of is Pele 'summoning' her to the volcano or wherever and challenging her. It sounds like it can work but we'll see when I get to that point. How wonderful. Pele is my favorite. Thank you, yeah Pele is something else. Uh-oh. Time to duck for cover! After that, watch the spectacle, of course! i love it. i see every element you describe trying to capture in this piscture. your splashes of Fire are nothing less than amazing !!! Thanks Victor, I am very pleased how this one turned out. I have been playing with Photoshop since version 1.0. Thanks God that the processing chips can catch up to the drawing now. My first 5 years doing it I had to wait hours for it to render and now it is all instant. Phew. Nothing is twisted in Photoshop it is all based upon layers I think this illustration had over 100 layers. It is all about layers dude. I was fortunate a Hotel in Maui wants to have this illustration blown up on canvas and hung in their lobby. Looks like you have to play more with photoshop and I have to play more with oils. WOW! Your flames are amazing! Stunning piece all around! Thank you for taking the time compliment my work. Stunning! I love the way you did the fire! Way cool of you to pass that compliment on, thank you. she's surely a godness!!! she's awesome!!!! In Hawaiian mythology I she is a Goddess, the Goddess of Fire. Thank you for taking the time to share a compliment on my work. my pleasure!!! but it was worth it and thank you 4 the informaion!!! Thanks I looked at your artwork as well. Phenomenal work. Thank you, I have many more I will be posting so keep an eye out.